Want to help our organization? We are keeping up with the times and made online donations available!! Your support is greatly appreciated. Would you like to be added to our Monthly E-mail Newsletters list? ​In 1986, a local Hayward fishing guide, Bobby Cammack, founded Fishing Has No Boundaries®, Inc. as the result of a broken leg. Bobby wanted to still be able to continue to fish, (a special passion of his) and enjoy the beautiful area lakes; but with a simple cast on his leg, fishing was not as easy anymore. The first event was held in 1988 on the Chippewa Flowage near Hayward, Wisconsin with 80 people attending from seven states. From this first initial event it has now grown into a national organization, helping thousands of disabled individuals participate fully in this recreational activity. It is doubtful that the originator of FHNB knew the extent of the impact they would have on people with disabilities. What began as a dream has now developed into a series of events that can touch the hearts and lives of disabled and able-bodied persons alike. The concept unquestionably increases the quality of life for both groups of people. FHNB events focus on educational fishing, providing persons with disabilities the opportunity to fish. Just as important, each event becomes a forum that creates public awareness and brings about needed change. Staging such an event requires strong support from local organizations (i.e. Chamber of Commerce, fishing club, civic group, etc.) with many local people as volunteers. For most volunteers it may be their first exposure to persons with physical or mental disabilities. With that kind of exposure, able-bodied volunteers quickly realize that in the end, people are people. They have the same dreams, wants and needs as anyone else. A large influx of disabled persons into a community will obviously create an economic plus and further heighten public awareness. In January 1991, Amerifish Corporation (Fishing has no boundaries, Inc.) signed a Memorandum of Agreement (MOA) with the U.S. Department of Interior and the U.S. Forest Service. This agreement makes public lands more accessible to those with disabilities. The Fish & Wildlife Service, Bureau of Reclamation, Bureau of Land Management and the National Park Service also signed the MOA and have pledged their support to these efforts. Recognizing the need for national expansion, this agreement will allow Fishing has no boundaries, Inc. to participate in helping to increase the use of public lands within the agencies’ jurisdiction. In 1998, The Department of Forestry also signed a Memorandum of Understanding with FHNB, Inc. that will further enhance FHNB relationships with important agencies. Persons with disabilities cross all lines of age, race, educational and income levels. Disabilities range from physical to mental, including birth defects, accident and military injuries. Through our contacts with the disabled community, we have learned that many disabled have the same needs for a positive self image, for the opportunity for self expression and for the genuine feeling of accomplishment. FHNB events are fulfilling those needs. 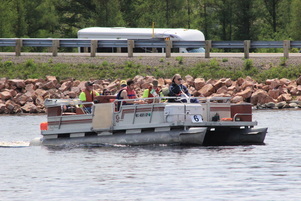 The response from the disabled community and volunteers who have participated in these events has prompted the Fishing Has No Boundaries, Inc. to re-examine its goals and direction. Creating public awareness of disabilities and the problems facing those with disabilities has become a prime focus for our efforts. FHNB, Inc. is rapidly becoming a source for information on adaptive equipment and accessible sites as well. Fishing has no boundaries, Inc. is a non-profit, non-stock, volunteer, organization dedicated to assisting the 53 million disabled individuals in the U.S.A. through the world of fishing and enjoying the great outdoors. FHNB, Inc. promotes access to the outdoors, nationwide, for the disabled by educating them of their abilities and by providing physical and mental support to further develop their confidence and abilities. Through research and development of special fishing equipment, dock loading systems, and boat adaptations, Fishing has no boundaries, Inc. is working diligently to create and provide access to all individuals regardless of their disability. For more information about Fishing Has No Boundaries, Inc (the National Organization) visit www.fhnbinc.org or their Facebook Page.